Trevor Paglen’s work and interpretation of space are great examples of the association between art and research. Blending photography, installation, investigative journalism and science, Paglen’s approach reveals that there is always more to an image than what we anticipate, and that these perceptions announce strong political meanings as well. Paglen’s background and professional life include being a musician and composer in the punk-scene; doing an MFA at the Art Institute of Chicago; and later receiving his PhD in Geography at UC Berkeley. “You are creating your own space”, reflected ARC Director Julia Bryan-Wilson, in conversation with the photographer. We can see how this is reflected in the images he produced especially when it comes to his series of photos of official places/objects that “don’t exist”; that are a political secret. “Open Hangar, Cactus Flats, NV, Distance ~ 18 miles, 10:04 a.m” (2007) exposes classified military bases and installations located in remote areas. The photo taken from a distance, combined with the heat waves and extended exposure time looks like a blurred landscape. The dichotomy of what you can and what you can’t see; what we know and what is hidden from us, is precisely a conversation the artist is trying to have. Parallels to a criticism on the “war of terror” and the military hidden agenda are addressed revealing the physical aspect to these ideas, and at the same time, how they continue to be obscured from us. The artist sees both the landscape and the act of seeing and understanding it as a performance: “It is not just about making images of this space, but a performance of someone trying to make the image of that space.” Paglen talks about the aesthetics of these acts, and how they are an example of the tension between what is seen and not seen. Beyond the final image, we ought to remember that there is a political performance happening behind those lenses as well. Images become allegorical for Paglen in that sense, and photography in this case, is understood as a platform in direct connection to the history of survey, fear, borders, etc. Other topics present in Paglen’s images are addressing artificial intelligence, and figures created only through algorithm representing a space, which leads to conversations on the role of the machine as the curator; on another project, similarly to the one on classified military spaces, Paglen offers a closer look to our sky, tracing airplanes, drones and secret satellites once again confronting people about the things we don’t know, bringing to light hidden images. The latter ultimately evolved into the project the artist is currently working on of his own satellite to be launched within the next few months. His goal with this new proposal is to launch something that has no specific purpose other than its aesthetics, as a purely artistic gesture of a giant mirror that reflects light down on earth. Although understanding this object as a very contradictory one, the artist also argues that by doing this experiment, for the first time one will be detaching the history of the satellite from a military one, therefore he names this as an “impossible object”. 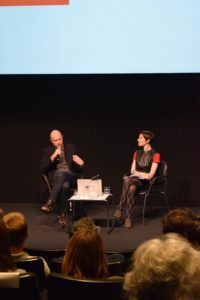 Laura Belik (PhD Student, Architecture) reviewed the Arts Research Center Event: Mapping as Research: Trevor Paglen in conversation with Julia Bryan-Wilson on April 24, 2018. To celebrate his first comprehensive artist monograph, Trevor Paglen (UC Berkeley Geography PhD and 2017 MacArthur “genius” fellow) discussed his work with ARC Director Julia Bryan-Wilson. Paglen’s work relentlessly pursues what he calls the “unseeable and undocumentable” in contemporary society. Blending photography, installation, investigative journalism, and science, Paglen explores the clandestine activity of government and intelligence agencies, using high-grade equipment to document their movements and reveal their hidden inner workings. The new publication includes a survey text by Bryan-Wilson and presents over two decades of Paglen’s groundbreaking work, making visible the structures and technologies that impact our lives.